Automated and flexible production processes are the answer to increasing quantities, smaller batch sizes, and high production speeds. Automated guided vehicle (AGVs) systems and their smaller relatives, automated guided carts (AGCs), were once mainly the preserve of production logistics in the automotive industry. SICK Automation’s portfolio ranges from sensor solutions for small AGVs or automated guided carts (AGCs) right through to specialised AGVs. Now, they are poised to conquer the world of intralogistics processes in the field of factory automation. These masters of logistics on wheels offer considerable potential within the electronics industry for tackling large production volumes, lots of small production stages, variable processes, and production environments with a high degree of protection. The automotive industry is showing how it is done. Automakers are abandoning inflexible conveyor belt systems in favour of production islands. By using islands, companies are able to respond efficiently to a variety of production specifications. For example: they can accommodate the kinds of custom-made products that are increasingly becoming the norm. As a result, further processing can be individually tailored to workpieces and hold-ups at individual stations can be avoided (because, as an example, the order of production steps can be varied). Automated transport systems are responsible for transferring the body parts between assembly islands – a scenario that would also work well in the electronics industry. Regardless of the industry in which it operates, any company that wishes to remain internationally competitive must increase its degree of production automation. This also applies to the electronics industry, which has a vital role to play in shaping what production looks like in the future. The technologies on which sensors and systems are based are key technologies for many future markets with a strong focus on automation. It is in the production halls of the electronics industry that the hardware is being created for the networked processes that make flexible production possible in the first place. It is not just sectors such as communications and entertainment that are constantly fuelling the demand for electronic components. As digitalisation continues, the electronics industry will also have to contend with growing demand from the industrial production environment as well. Another area that is generating increased demand is the smart living sector, which calls for progressive networking solutions that weave together communications, transport and living. In order to accommodate these requirements successfully, the electronics industry must rise to the challenge of flexible production automation itself. Wherever there are lots of small production stages with lots of variety, automated guided vehicle systems release companies from their dependence on conveyor belt throughput capacity and station processing rates. Automated production systems constantly record where the products are and what state they are in when they leave the individual production islands. Seamless quality control can be ensured between the production islands thanks to the operational profile of the automated guided vehicle systems. In situations where deploying workers would be difficult or harmful to their health, there are even more application possibilities for automated guided vehicle systems. For instance, they are already being used as rugged transport vehicles in cleanrooms or solar cell/display production, as well as for transporting heavy battery packs in the battery making industry. AGVs are often too large for the electronics industry, where there tends to be lots of small production stages that are geared toward economic and spatial efficiency. AGCs are a smaller and more cost-efficient form of transport but are still customisable. As a result, they are the main contender when it comes to finding a flexible method of automating production. SICK has spent years helping its customers to develop production and logistics processes that are more flexible and more highly automated. The result? Comprehensive solutions based on intelligent sensor technology and consulting capabilities that bring together mechanical engineering know-how with expertise in electronics. The company has successfully implemented a number of automated guided vehicle systems. These are already showing how an extensive range of sensor functions can be combined for the purpose of transporting products safely in all kinds of processes. SICK offers solutions for all navigation, safety and detection tasks with its perfectly co-ordinated sensor products, which are all available from a single source. Code readers and RFID technology automatically detect what an AGC is carrying, laser scanners guide the vehicle, and encoders monitor the speed and direction of travel. The sensors are also not limited to the vehicle itself. 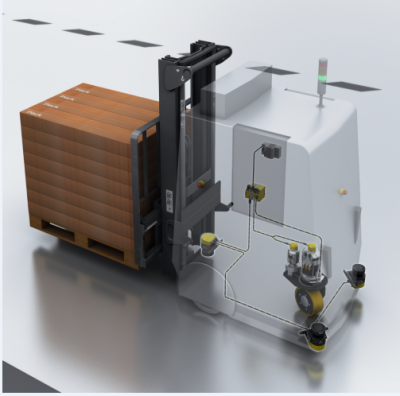 They also represent the link between the automated guided carts and the production control system. AGCs usually still rely on a ready-made route network to travel between the production islands, which typically involves using magnetic or optical lane guidance. Free navigation based on reflectors or contour detection is gaining ground – among AGVs and their smaller relatives, AGCs. The ability to create travel routes with absolute flexibility using SLAM methods (Simultaneous Localisation and Mapping) is already becoming a reality. This means specific requirements or a particular system can be accommodated flexibly by making the necessary changes to them. It is not only the customisable functions of the AGCs that are worth noting but also the energy efficiency of these little racers. The ‘onboard electronics’ only consume as much energy as is actually required so that these agile navigators do not spend most of their time at the charging station.